The Supreme Court’s opinion in Trump v. Hawaii, affirming Donald Trump’s Muslim ban, allows the United States to act in flagrant violation of international law. Under the guise of deferring to the president on matters of national security, the 5-4 majority disregarded a litany of Trump’s anti-Muslim statements and held that the ban does not violate the First Amendment’s Establishment Clause, which forbids the government from preferring one religion over another. Neither the majority nor the dissenting opinions even mentions the US’s legal obligations under international human rights law. The travel ban violates two treaties to which the United States is a party: the International Covenant on Civil and Political Rights, as well as the International Convention on the Elimination of All Forms of Racial Discrimination. It also runs afoul of customary international law. The case that the Supreme Court ruled on this week involved the legality of Trump’s third travel ban. Issued by Trump in a “Proclamation” on September 24, 2017, the third iteration of the ban restricts travel by most citizens of Libya, Syria, Iran, Yemen, Chad, Somalia and North Korea. The ban forbids everyone from Syria and North Korea from obtaining visas. Nationals from the other six countries have to undergo additional security checks. Iranian students are exempted from the ban. The ban also forbids Venezuelan government officials and their families from traveling to the US. 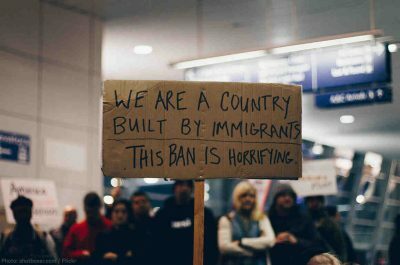 More than 150 million people, roughly 95 percent of them Muslim, are affected by the ban. Two prior iterations of the ban restricted travel of citizens from only Muslim-majority countries. After federal courts struck them down, Trump cosmetically added Venezuela and North Korea to avoid charges of religious discrimination. As Justice Sonya Sotomayor, joined by Ruth Bader Ginsburg, wrote in her dissent, “it is of no moment” that Trump included “minor restrictions” on North Korea and Venezuela – two non-Muslim-majority countries. Travel by North Korean nationals was already restricted and the ban only bars travel by Venezuelan officials and their families. All of the justices on the Supreme Court ignored significant international law arguments in their majority and dissenting opinions in spite of an amicus brief signed by 81 international law scholars, including this writer, and a dozen non-governmental organizations. The amicus brief drew attention to the travel ban’s violation of the International Covenant on Civil and Political Rights and the International Convention on the Elimination of All Forms of Racial Discrimination, both of which the United States has ratified. Customary international law arises from the general and consistent practice of states. It is part of federal common law and must be enforced in US courts, whether or not its provisions are enshrined in a ratified treaty. Courts have a duty to rein in federal executive action which conflicts with a ratified treaty. The Immigration and Nationality Act and other statutes must be read in harmony with these international legal obligations pursuant to the Supremacy Clause of the Constitution and long established principles of statutory construction requiring acts of Congress to be interpreted in a manner consistent with international law, whenever such a construction is reasonably possible. But the Court did not construe the legality of the travel ban in light of US treaty obligations and customary international law. The primary thrust of the ban is to prohibit Muslims from entering the United States and thus constitutes religious discrimination. By singling out specific countries for exclusion, the ban also makes a prohibited distinction on the basis of national origin. The International Covenant on Civil and Political Rights prohibits distinctions based on religion or national origin, which have “the purpose or effect of nullifying or impairing the recognition, enjoyment or exercise by all persons, on an equal footing of human rights and fundamental freedoms,” the United Nation Human Rights Committee, which monitors compliance with the International Covenant on Civil and Political Rights, has said. Although the International Covenant on Civil and Political Rights does not generally “recognize a right of aliens to enter or reside in the territory of a State party … in certain circumstances an alien may enjoy the protection of the Covenant even in relation to entry or residence, for example, when considerations of non-discrimination, prohibition of inhuman treatment and respect for family life arise,” the Human Rights Committee opined. The International Covenant on Civil and Political Rights prohibits discrimination against the family. “The family is the natural and fundamental group of society and is entitled to protection by society and the State.” Immigrants and refugees flee their countries of origin and come to the United States to reunify with their families. The covenant protects them against discrimination based on religion or national origin. They need not be physically present in the United States to enjoy these protections. The non-discrimination provisions of the International Covenant on Civil and Political Rights also constitute customary international law. In 1948, the United States approved the Universal Declaration of Human Rights, which is part of customary international law. The declaration forbids discrimination based on religion or national origin, guarantees equal protection of the law, and shields family life against arbitrary interference. States parties to the convention “shall not permit public authorities or public institutions, national or local, to promote or incite racial discrimination.” Parties are required to outlaw speech that stigmatizes or stereotypes noncitizens, immigrants, refugees and people seeking asylum. 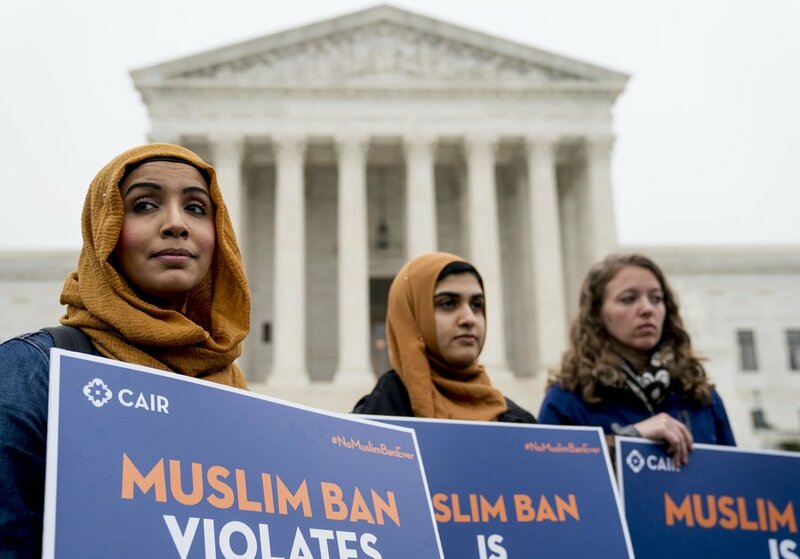 Even though the Supreme Court majority held that the ban did not violate the Establishment Clause of the First Amendment, much evidence exists to the contrary. The Establishment Clause says, “Congress shall make no law respecting an establishment of religion, or prohibiting the free exercise thereof.” That means “one religious denomination cannot be officially preferred over another,” according to Supreme Court case law. Roberts wrote that the Court could consider the president’s statements “but will uphold the policy so long as it can reasonably be understood to result from a justification independent of unconstitutional grounds.” Courts must give great deference to the president in immigration matters and will uphold his policy if it has any legitimate purpose, Roberts noted. Sotomayor spent seven of the 28 pages of her dissent listing more than a dozen statements by Trump denigrating Muslims. She cited the policy’s initial purpose as a “total and complete shutdown of Muslims entering the United States,” in Trump’s words. But that policy “now masquerades behind a façade of national security concerns,” Sotomayor wrote. Trump said President Franklin D. Roosevelt “did the same thing” with his internment of Japanese Americans during World War II, Sotomayor noted. Trump told a story about General John J. Pershing killing a large group of Muslim insurgents in the Philippines with bullets dipped in pig’s blood. When he issued his first ban, Trump explained that Christians would be given preference for entry as refugees into the United States. He also retweeted three anti-Muslim videos. [A]s they have done against other Trump policies, other transnational actors will invoke what I have called “transnational legal process” to contest and limit the impact of the court’s ruling. As they did after losing the Haitian interdiction case at the Supreme Court 25 years ago, litigants will surely seek out international fora to make arguments against the travel ban based on international law. The Constitution’s Take Care Clause requires the president to “take care that the laws be faithfully executed.” Trump has a constitutional duty to comply with US legal obligations under both treaty and customary international law. By enacting a travel ban aimed at excluding from the United States people from six Muslim-majority countries, Trump has violated both the Constitution and international law. Marjorie Cohn is professor emerita at Thomas Jefferson School of Law, former president of the National Lawyers Guild, deputy secretary general of the International Association of Democratic Lawyers and an advisory board member of Veterans for Peace. An updated edition of her book, Drones and Targeted Killing: Legal, Moral, and Geopolitical Issues, was recently published. Visit her website: http://marjoriecohn.com. She is a frequent contributor to Global Research. Featured image is from ACLU.